Yesterday was not a normal day specially for us at Indian Subcontinent. The representatives of two warring nations were first time standing on a world platform and that too for peace. I am talking about Kailsh Satyarthi and Malala Yousufzai , recipient of Noble Peace Prize for this year who belongs to India and Pakistan respectively. The two nation which are enemies,friends and brothers. 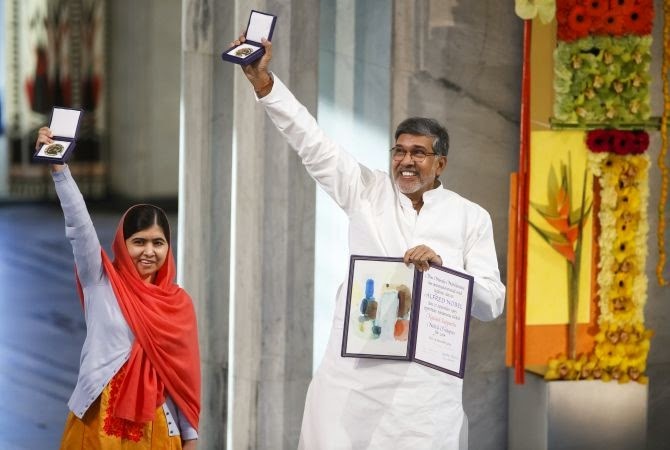 Both Kailash Satyarthi and Malala Yousufzai are fighting for the rights of children in their countries. Satyarthi's Bachpan Bachao Aandolan is committed to bring working children into schools and to provide them environment where they can dream for themselves. As he himself said that he represents the sound of silence and the cry of innocence and their is no greater violence than to deny the dreams of children. Malala on the other hand is fighting hardliners who oppose education for children which in turn restrict them to dream a good life. She said during his noble prize speech that making tanks are easier in this world than to make schools. Why is it so that such flag bearers of child rights were never honoured in their homeland ? Is it because children don't vote ? Don't voice their problems with candle marches ? Why media don't focus on problems like child labor and children education? We can easily see debates on construction of temples and mosques but never on construction of schools. We never ask a working child why he/she don't go to school. We have accepted that poor children must work and we even employ them in our homes and factories. This award to them is reminder for us to contribute in upliftment of deprived children. For those children who are deprived of education and of better life. I like to salute both Kailsh Satyarthi and Malala Yousufzai for their efforts in this field and hope that we all should work hand in hand for dreams of our children. For dream of a better tomorrow. It is also a time to cherish and to strengthen our believe that India and Pakistan can stand for peace together. well written Cifar. Vote for peace.! If #IndiaWithPakistan, then #PakistanWithIndia too should be the case.